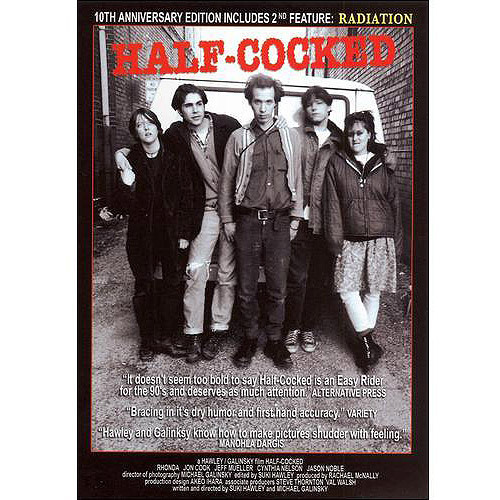 I first heard of Michael Galinsky and Suki Hawley’s film Half-Cocked through its soundtrack, which contained an impressive array of indie bands circa 1996: the Grifters, Unwound, Helium, and Versus. Not long afterwards, I saw the film, in which a young woman living in Louisville (played by Tara Jane O’Neil) who, along with her friends, steals the van belonging to her older brother’s band. (Said older brother is played by Ian Svenonius, in a wonderfully self-parodying mode.) The ensuing film is a hybrid, somewhere between a story of a young band on the road and a low-key take on the “young outlaws on the run” plot. I was in film school at the time — something that will become very clear as you read the interview — and was deeply intrigued by the idea of an indie film that touched on a music scene for which I felt a strong affinity. The film itself was reissued on DVD a few years ago; since then, Galinsky and Hawley have made such films as Battle for Brooklyn, about the controversy surrounding the Atlantic Yards project; and Horns and Halos, about the process of publishing the book Fortunate Son in 2000. This interview was conducted by phone in the summer of 1997. It appeared in issue 3 of Eventide. Can you say your names and what you did on the film. Michael Galinsky: I’m Suki. No, I’m Michael Galinsky, and Suki and I made this film together, basically. Suki Hawley: It was February of ‘94. Did either of you have a background in film before you shot it? Suki: I did. I had lived and worked in LA for about a year before the film; I was working for Roger Corman, primarily in the cutting room. I had a background in editing, mostly. What was influencing you when you wrote the screenplay for the film? Michael: I’m in a band called Sleepyhead, and most of the people in the film were people that we met while on tour. We were really inspired by them as people, and the things that they were able to get done. There was just a lot of stuff going on around them that was really great. We were really interested in working with them. Suki: That’s a good question, because Mike had been on tour…how many times before the movie? Michael: Several, like four or five. Suki: Yeah, and they had gone on tour, with Ruby Falls. I sort of booked the tour and went with them. Primarily, the script was based on Mike’s experiences on tour, and I had a good understanding of the places and locations, having just been on tour myself. Michael: To the same places that were the setting of the film. The film starts in Louisville; are either of you from there? Michael: One time when we were on tour, we stayed at the Rocket House. And we weren’t even playing in Louisville, and there were like five bands staying there. There was just something about them that seemed like it was perfect for making a teen riot film. Suki: Because the point of having it at the Rocket House was-I don’t know if you want to explain it, Mike. It was sort of based on that whole experience, of you being there with five other bands from all over. It was sort of a hub for all of these people on tour. That was the idea, to start from there in the script and then go out. Michael: Not that long. It’s kind of funny, because Suki has more of a background in film, and so she knew how things normally go. And everything we did not so normally. Like usually it takes you to go from start to finish, in terms of getting ready to getting the thing in the can. We had the idea in November, we had a script by December, and we were shooting in February. Now, having started to work on other things, it’s hard for me to believe that it happened like that. How much did the film cost to shoot? Michael: The shooting budget is usually only about a third of it. A lot of money’s spent on the editing and the printing and stuff. Was everyone in the cast people that you had known beforehand? Michael: Yeah. And we pretty much wrote the roles for the people. We knew the people a little bit, so we wrote thinking of what they might say. The whole idea was to keep it fairly loose, and let people…. We worked through some of the stuff. We did quite a bit of that, actually. We practiced some of the scenes, made it more natural for them. Especially Ian Svenonius (of Nation of Ulysses and Make Up fame-ed.). He really changed his part in a really great way. Suki: Mike knew all of the cast members, and I knew all of them except for the Ian clan. He showed me a picture of them live, and I said, “Okay, he’s the older brother.” (laughs) But I had never met him before we started shooting. Was that the same way that you got bands for the soundtrack? Michael: I had done photos for almost all of them at some point, so it was kind of like the returning of a favor. It was just a way for them to help support what we were doing. At this point, I think that all of the bands are going to get a small royalty check really soon. Suki: That should be nice. What filmmakers do you admire? Michael: I really like the Mazels Brothers, and John Cassavetes, and Bob Rafelson. Suki: The Coen brothers have always been one of my favorites. Did you have any influences in making the film? Michael: What we were trying to make was a teen riot film, in the same way of something like Over the Edge. Something that we felt would be a strong film that people in the age group could really relate to, in a real way. We were also watching a lot of things like Cassavetes, that were really inspiring us in terms of being able to think about getting things done. When was the first screening of the film? Michael: It was in the fall of ‘94. That all happened pretty quickly, too. Within six months, we had a finished print. It was a cast and crew screening in New York. At Thanksgiving, we showed it for a second time in North Carolina. Suki: We went home to Mike’s parents’ house for Thanksgiving and showed the movie. Did it play at any festivals? Michael: A couple of underground festivals, like the Chicago Underground, the New York Underground, the Athens, Ohio festival. It really didn’t do well at festivals; we applied to a lot of them and didn’t get in. We also had a tough time finding someone to distribute it. So we basically just took it on tour. Suki and I and our friend Tim Foljan formed a band, and we opened for the film. We showed it in rock clubs. Did you get a good reception there? Michael: Yeah. It was primarily a really great thing. Suki: Yeah. It was fun. How did Matador wind up distributing it? Michael: Well, we had always been hoping to get someone who actually does videos to distribute the film to theaters, but we had a difficult time with that. So, since Matador was already doing the soundtrack, which they had agreed to do very early on, before the script was competed, it just made sense for them to do it. We talked to them about it, and just actualized it. Suki: They were looking to start a video section of Matador, I think. Michael: Yeah, we’re going to go to Spain in the fall and make a film. Michael: It’s a film about a tour promoter who is sick of being a tour promoter, but he’s also a speed dealer. The band that he’s supposed to take on tour splits, so he still has to go on the trip, because he sells the speed on the road. It’s kind of along the same lines as Half-Cocked, because it’s going to be semi-documenting real people in real situations, but creating an air of fiction to do it. How much of Half-Cocked was based on real experiences that had happened to people? Suki: It was all kind of exaggerated reality. I know that the scene with the waitress, where she suggests that they rob the restaurant, was just something that Mike had written to me while they were on tour. He’d written it in a letter-”Wouldn’t it be funny if this happened in a scene?” Actually, he wanted to base the whole movie around that idea, but I was like, “Not the whole movie-let’s make that a scene”. It was sort of what was inspired by being on the road. He always got a lot of ideas on the road. What did the cast think of the film? Michael: I think in some ways they liked the film a lot, and in some ways it’s just too close and frustrating and them, to be playing a show as their own band and have people coming up to them, talking about the film to them. Things like that, I think, can be annoying. But I think that they’re pretty happy with it. Suki: Why do you think annoying? Suki: I’m not sure it’s annoying. (laughs) I think it’s just disconcerting. How many copies of the video has Matador sold? Michael: We don’t know; they haven’t told us anything. Have you been getting feedback from people who have seen the video? Michael: This is literally the very first article where anyone has talked to us about it since the video came out. Suki: Which is funny, because there were a lot before the video came out. I saw some of the reviews on the back of the video box; it seems like people were really enthusiastic about it. Michael: Yeah, but that was all from actual screenings. I haven’t seen one mention of the video anywhere. Suki: Actually, I’ve heard from the grapevine, from people who went to Vermont to ski, that this little record store had a poster up. But it’s not tangible to us at all. We have no idea what’s going on with it. I had first heard of it when I was interviewing Versus for NYU’s arts paper, because it was mentioned in their press kit. Then I saw the video a few months later, and picked it up. Michael: We’re trying to figure that out right now, actually. That’s going to be shot in October; we’re taking Half-Cocked on tour in Spain. That was how this came about. Since we’re going anyway, and we had some ideas, we just figured we’d make a film at the same time. Do you have any of it cast yet? Michael: Yeah. It’s pretty much the same idea, where we’re writing the characters based on real people. Is it going to have any of the same cast members as Half-Cocked? Michael: No, ‘cause it’s in Spain. So it’ll be a European cast? Are you satisfied with how Half-Cocked turned out? Michael: I’m overwhelmed by how well it turned out. I know how badly things can go and how difficult it can be, and I was surprised that we were able to pull it off. Suki: You weren’t pre-doing it, but now you are? Michael: I’m pretty happy with it. Suki: Michael was the main source of inspiration for getting Half-Cocked done. He believed that anything was possible. Michael: Not anymore! (laughs) Now I’m a cynic. What type of film stock did you use to shoot it? Michael: Kodak black and white, 200 ASA, mostly. 72 something something. Did you light a lot of the scenes, or did you use the natural light? Michael: We used a lot of natural light, and we used-do you know what a Chinese lantern is? Michael: We used a ton of Chinese lanterns. And we made a little soft box, and that was the extent of the lighting. Suki: We were really lucky, because we had this old friend who was the drummer in somebody’s band when I was in college, who turned out to have gone to film school. and I lost touch with him and found him, and he was the lighting guy for documentaries, which was the perfect kid of lighting guy for Half-Cocked. We were doing such quick set-ups, running around….we shot the whole film in two weeks. Suki: And basically just throwing up lights. And he knew about building the soft box; he was just the perfect type of gaffer to have along. Michael: Yeah; it was great. Where else besides Louisville did you shoot the film? Suki: It went: Louisville, Chattanooga, Nashville. What else do you do besides film right now? Michael: A lot of stuff. I’m trying to make some photo books right now. I’m in a couple of bands. Michael: I’m in a band called Sleepyhead; I’ve been playing in a band called Sammy as well. It takes a lot of time. And I’m making some photo books; that’s taking a lot of time as well. This weekend, we’re shooting for a documentary that we’re doing about the David S. Ware Quartet. They’re a jazz saxophone quartet; David S. Ware’s the saxophonist. They’re playing at the Knitting Factory, so we’ve been working on that. Are you shooting that on film? Michael: No; that is actually on digital video. Do you have any other plans? Any projects in the future? Michael: It’s just the movie in Spain and the David S. Ware project right now. They’re both going pretty well. I guess that’s it; do you have anything to say in closing?